Last I checked, this anime was available on DVD at Tranzor Z DVD's!! and Amazon. Of the many Japanese cartoons to cross over to our shores, Tranzor Z may well be the strangest. 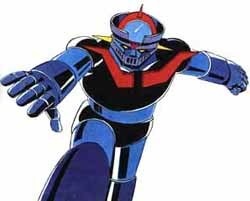 The title character was a giant robot equipped with an impressive array of weapons. In addition to his rocket fists, laser eyes and other amazing firearms, the robot was constructed from an indestructible material known as Alloy Z. The alloy and the robot were both developed by Dr. Wells, who had discovered a way to harness the energy from volcanoes. Unfortunately, Dr. Wells was killed in the first episode and his lab was destroyed, but as he lay dying, his nephews Tommy and Toad discovered the doctor. After explaining how the robot worked, Dr. Wells passed away, leaving Tommy to use TranZor Z to battle evil. Tommy and his robot were assisted by his girlfriend Jessica and her female robot Aphrodite A. Completing the team was Bobo, in his hot rod Mobilbot. But the best part about this cartoon was, without a doubt, the villains. Dr. Demon wanted nothing less than to rule the world and had no problem destroying anything that stood in his way. He used his Fork of Fury (a magic staff) and his Doom Machines (evil giant robots) to terrorize the planet in his quest for power. Demon's henchmen were not to be trifled with either. Dr. De-Capito was an Aryan-like madman whose head floated independently from his body, and Devilene the She-Man was half man, half woman, split right down the middle like a circus attraction. According to the narrator, Devilene possessed the worst elements of a man and a woman, leading us to believe that the character was always talking, but never listened to a word it said. The creepiness of Devilene was compounded by his/her speech, which was a combination of a male and a female voice. Equal parts realistic action and silly camp, Tranzor Z had the best of both worlds. Though short-lived, the show developed a strong fan base that continues to hope for the return of this "protector of peace so powerful, he cannot be destroyed." The above description came from Yesterdayland, and was edited by yours truly (contact me).